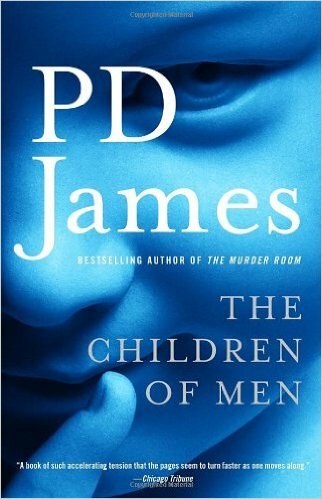 These are my first impressions after rereading The Children of Men (P. D. James; 1992) in October 2009. I will be discussing The Children of Men in future essays. Spoilers. P.D. James is well known as a mystery writer, but she took a departure from her usual genre with this apocalyptic story. The Children of Men takes place in a near future 25 years after people have stopped giving birth and are, as a result, facing the end of the species. No explanation is given for the sudden loss of fertility — it is presented as having baffled scientists and doctors — but James seems more interested in its effects on the characters living out the last days. The story is set in England, which has fallen under dictatorial rule in the name of providing the public with what they most want: security, comfort, and pleasure. Criminals are shipped off to the Isle of Man, where they live in violent anarchy, and young, desperate immigrants are brought in to do the scut work as second-class citizens, only to be deported when they become too old or too useless. The British elderly are taken out to sea and drowned in group “suicides,” called the Quietus, much like unwanted kittens. The tone is bleak, hopeless, and filled with ennui and a sense that God has abandoned mankind. The book is divided into two parts: Omega and Alpha. Once the reader learns that Omega is the name of the last year in which there was a birth, as well as of the last, spoiled, soul-less generation, it is simple to guess what Alpha represents: the first pregnancy in a quarter-century, a secret that propels forward the action in the second half of the novel. The story is told from the point of view of Theo Faron, a professor of history at Oxford. Theo is so far removed emotionally from his life and the people in it that he is not even greatly affected when he accidentally kills his own baby daughter. This makes him very hard to like. He begins to change when he meets Julian, a young woman who is a member of a hapless, amateurish revolutionary group called the Five Fishes, formed to protest England’s dictatorial policies. Julian asks Theo to intercede with his cousin Xan, who happens to be the dictator, or Warden, of England. After meeting with her group and then witnessing a Quietus firsthand, Theo realizes that he can no longer be an observer, but must step on stage and become an actor in what’s happening to the human race. The first half of the book alternates randomly between Theo’s diary entries and third-person narrative. I’m not sure why James felt that the diary sections were necessary, as the third-person chapters are also limited tightly to Theo’s perspective, and the diary itself proves not to be very important to the story. After one last entry, the diary literally disappears soon into the second half of the book. The action ramps up as Theo joins Julian’s group on the run from Xan’s Grenadiers and discovers that Julian is nine months pregnant. Theo’s growing love for Julian and his awe at her maternal state transform him from a passive, apathetic observer into a passionate actor willing to lay down his own life for the cause. The scene when Julian reveals her pregnancy in an abandoned church and Theo gets down on his knees before her to hear the baby’s heartbeat is the most affecting moment in the novel. Theo, Julian, and the rest of the group go on the run to find a safe place for Julian to give birth. Everything is stacked against them, of course, and one by one they lose their companions until Theo and Julian are alone, literally, in the wilderness, with Xan and his soldiers bearing down on them. The ending (which I won’t reveal) may seem to be a happy one on the surface, but I think it is much more ambiguous than that, and there remains a real question as to whether this new baby will actually restore hope to the world. The Children of Men was made into a movie in 2006, but if you have only seen the adaptation, know that it differs greatly from the novel in many respects. While the basic premise and characters remain the same, the future depicted in the novel is not as brutal or chaotic as in the movie, but it is perhaps more quietly bleak and hopeless, a tone that rang truer to me. The ending of the novel is quite different from the movie and would not be spoiled by seeing the film first.